I'm Off To See The City, A Wonderful City In Oz. 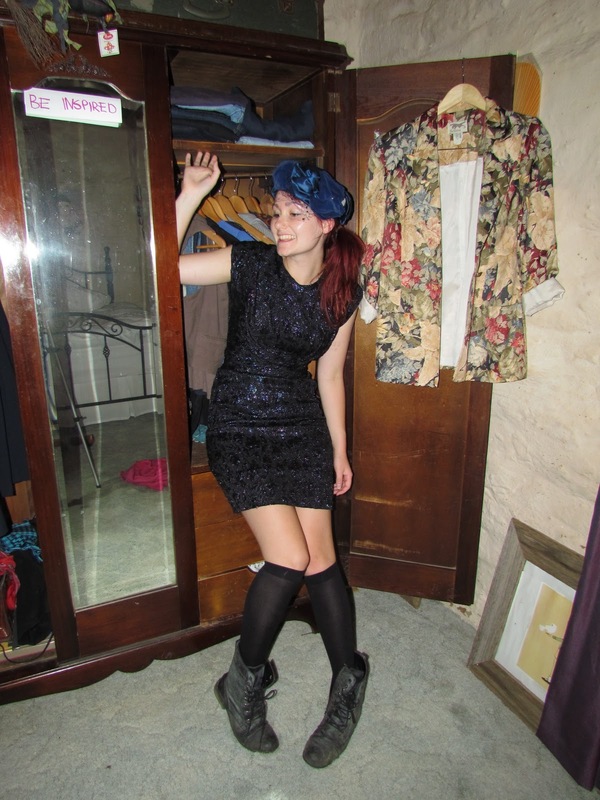 I am wearing a vintage hat and dress, random black socks and Rubi Shoes commando boots. Also, the amazing floral blazer hanging up in the background I found in a local Oppy. In less than 12 hours I will be moving out of home and heading down to MELBOURNE! OMG O-Week is about to begin! After some fairly in depth debate with friends and family I have decided for the Beach Party to dress as a pirate (I found this wicked pirate hat for $4 at a cheap shop!) and for the Super Hero Party I've chosen to go as one of the Incredibles (the stretchy Mum one!). I just LOVE themed parties so I am MEGA pumped! Orientation Week is going to be EPIC! Organized events left, right and centre and I have an appointment to meet the Dean (which I am still undecided about what to wear!). WOW I am going to be busy! In tribute to my beautiful (half empty) bedroom that has treated me so well, I have taken these shots tonight with what is left of my wardrobe. I have packed two large boxes full of clothes and have created a shortlist of 10 bags (choosing which bags made the cut was VERY difficult!) and I also have a suitcase full of shoes! I hope there will be enough room in my little shoe box to fit everything! Hope you sleep well, I know I wont! 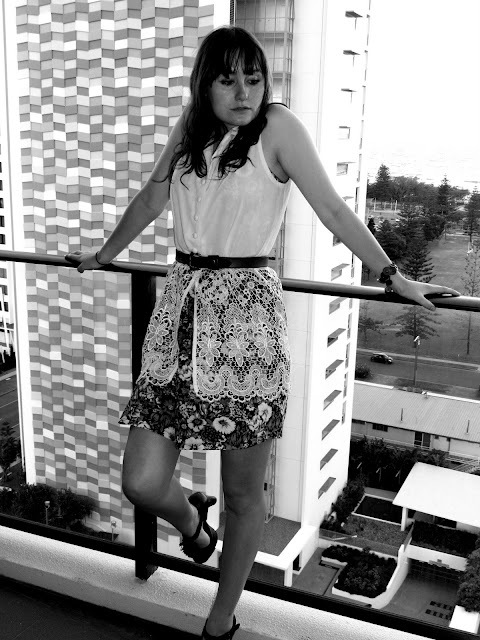 Here I am standing on the balcony at BroadBeach Queensland wearing a thrifted blouse and floral romper, a borrowed belt, RMK heels and handmade button bracelets. Wow! I officially MOVE OUT this Sunday! I can't believe how quickly my move in date has come around. I can clearly remember this time last year as I was frantically applying for jobs to fill in my gap year! Orientation Week is going to be EPIC! Already I have booked my tickets for the "Beach Party" but am having real trouble deciding what to wear! Can anybody out there help me with this?? I DO NOT want to strut around in a skimpy bikini top and skirt as for one I am so NOT tanned and plus after I have a few drinks my "sucking in" tummy muscles will go on strike (beach babe with a pot belly-so NOT cute!). I think I might be leaning towards a life guard or a palm tree but still very undecided! Let me know if you have any "Beach Party" get up ideas! Strapless dress from Girl Star, lace shorts and pearl bracelet borrowed from a friend, rings from Rubi Shoes and heels are from Zulu. Hanging out with mates on the weekend can only equate to good times. So with my bag packed with all the party essentials (heels, cheap wine and bright lip stick) I headed off the Bendigo accompanied by a friend for a great night out on the town. We did a lot of dancing (my poor feet are still sore! ), laughing and not to mention drinking! A hot tip for every party goer out there; three is the best number of people to go out with as you always stick together and it never gets boring! But as always there is a downside of having TOO much fun as I definitely did NOT feel my Sunday best today that is for sure! However a Maccas cheese burger did help with the hangover! Hope you all had an amazing weekend! What A Fine State To Be In. Thrifted high waisted shorts, Mink Pink one piece bathers and dress (worn as cape), Equip sunglasses, and Soles gladiator sandals. I have just arrived home from my mini vacation to Broad Beach in the lovely state of Queensland. Sun, sand, beaches, theme parks and good times! What's NOT to love? Our apartment was amazing and had the most incredible ocean views! How I would love to live by the sea! My week was pretty busy from spending three days screaming my head off at the theme parks, playing tennis, splashing around in the pool and ocean, walking over FIVE kilometers in search of Op shops (it was so HOT-30 degrees!) and eating some amazing food (ranging from Italian to Indian to Thai). The soles of my feet are still recovering from the amount of walking I have done! 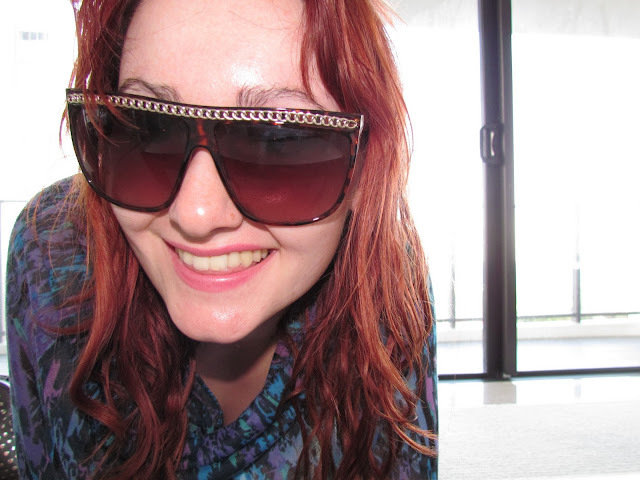 I even managed to get a slight tan and not get sunburnt! Amazing! However I have noticed a few nasty freckles have popped up on my face-one of the disadvantages of dozing in the midday sun. It was kind of sad leaving the ocean but the fact that it was raining cats and dogs as we were waiting at the airport was very comforting. The weather all week was perfect so to leave at just the right time made our week even more special. Hope the weather is treating you well. PS. 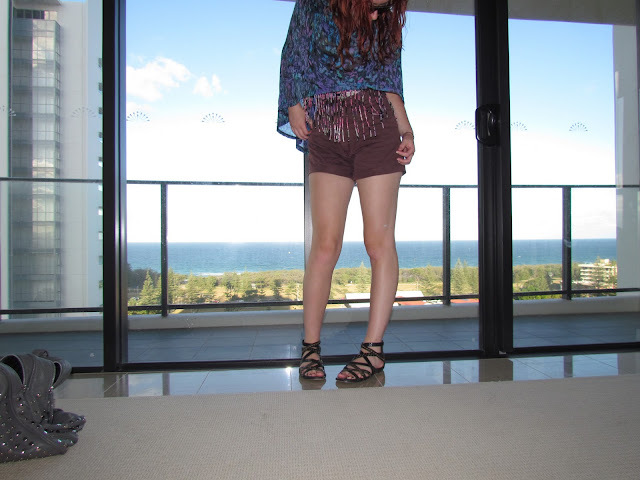 The pieces I found from the Broad Beach Op Shops are epic so stay tuned! It's The Final Count Down. Brown Sugar silk dress, thrifted Country Road singlet and belt, Sportsgirl necklace, Valley Girl headband and my sisters Tony Bianco's heels. 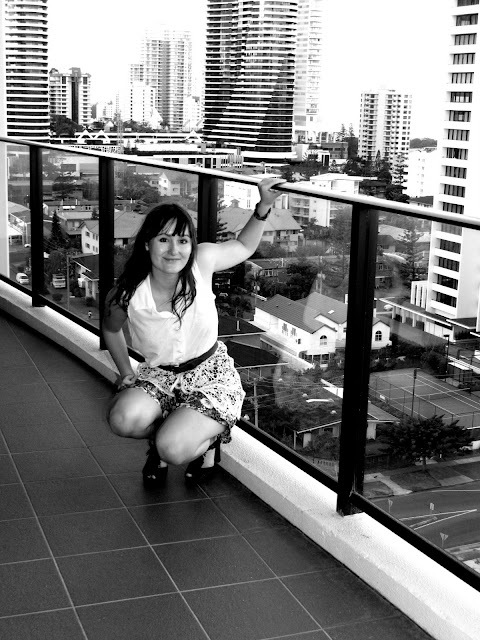 In little less than a month I will packing up all my stuff and moving to MELBOURNE! I can't believe my Gap Year is finally over! I had my last "Official" day at work on Friday and it was probably the worst day I had all year. Everything was going wrong, I deleted a spread sheet I had been working on ALL morning and had to re-do it and whilst at lunch I got a $40 parking fine! Looking back now I can laugh about it. Bad luck can be really funny! 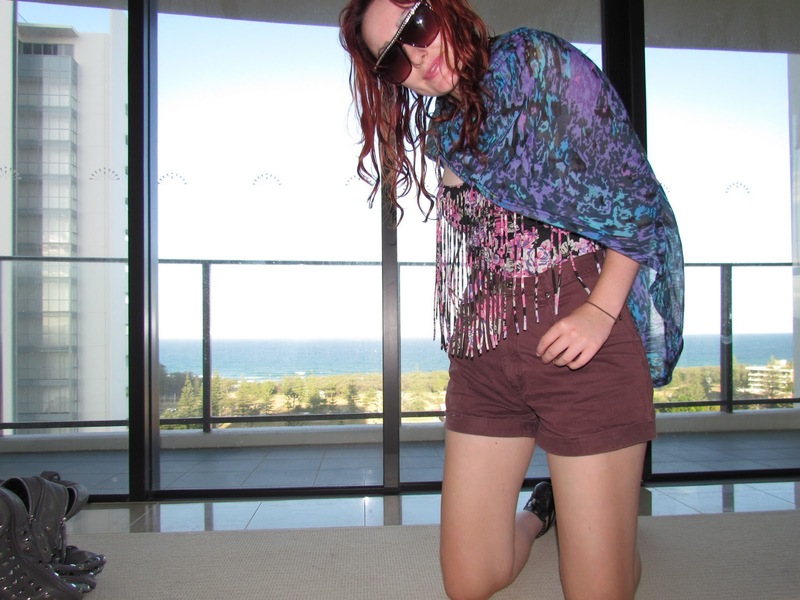 So before I head to University I am taking a weeks vacation at the Gold Coast with some friends. I can't wait! We will do doing the theme parks (I'm psyching myself up to go on that awesome new water ride at Wet'n'Wild- it will be EPIC!) and I will be swimming in the ocean. Ah the bliss, I can smell the sea breeze now. Hope you are planning your own mini adventure. Good luck! 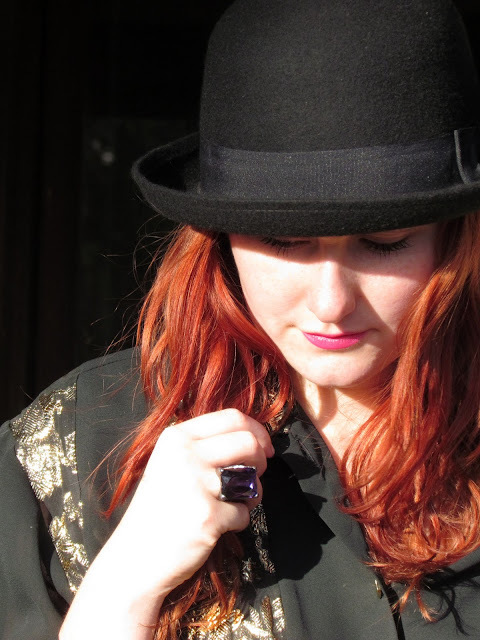 Hats Off To Good Times. Isn't awesome when your sister has the same shoe size as you? It's definitely a money saver when you can borrow sick heels like these for 10 minutes to take some pics without actually spending any cash. I have been on the lookout for some new party heels of late but haven't found the perfect pair just yet. I really want a pair of Jeffrey Campbell's amazing mega heels but am a little scared about buying shoes over the net. What if they don't fit! That would just to TOO tragic! The majority of this outfit is thrifted which I just LOVE. The fact that style doesn't have to cost a small fortune really appeals to me! 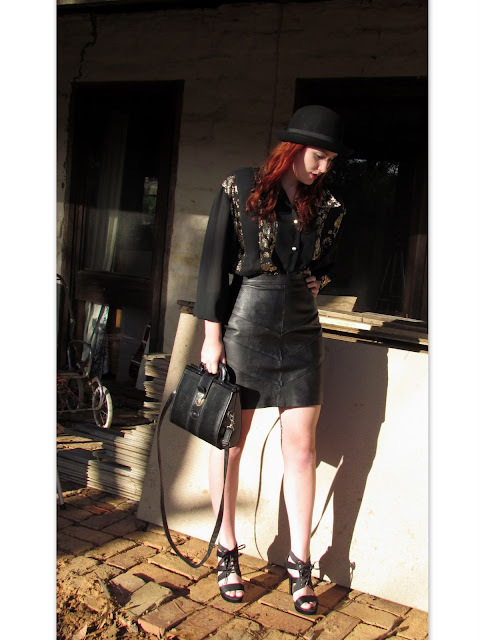 The pleather skirt, vintage bag and shirt I found at the local Oppy whilst the hat came from Sportsgirl (on sale!) and the purple stone ring I borrowed from my sis. All in all a VERY VERY cheap outfit! Gotta love it! Oh and just a note to say I finally got my I PHONE! It's only taken three months but I got one in the end! Also, I purchased a new Canon Power Shot SX30IS camera so I can finally use MY OWN camera! I have been using my Dad's Sony since I started this blog and I am so excited I have a camera to call my own! Here is a college featuring my very recent Op Shop finds. 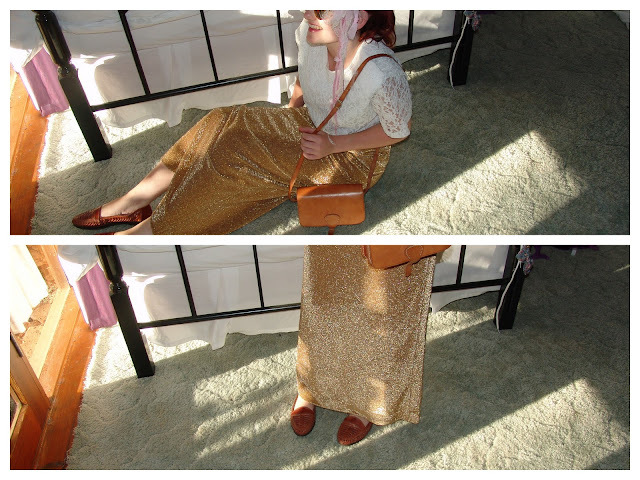 Whilst rushing around on my lunch break today I ducked into the local Salvo's and discovered this amazing leather envelope bag and gold shimmery maxi skirt. I nearly cried out loud when I found this skirt because not only is it this seasons MUST HAVE but it is incredibly unique and beautiful. 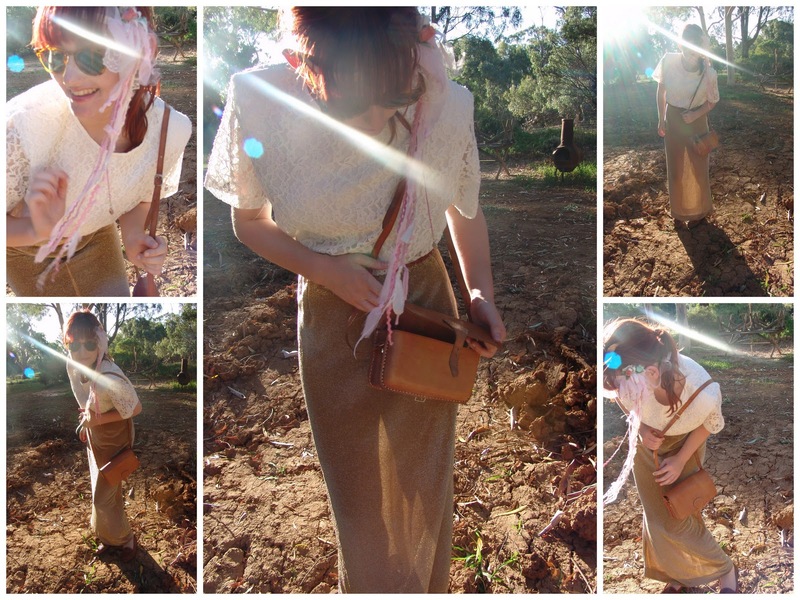 Teamed with my new purchases is a combination of the following thrifted finds; a pair of vintage leopard print sunnies, a white lace T, a leather plaited belt and pair of loathers. 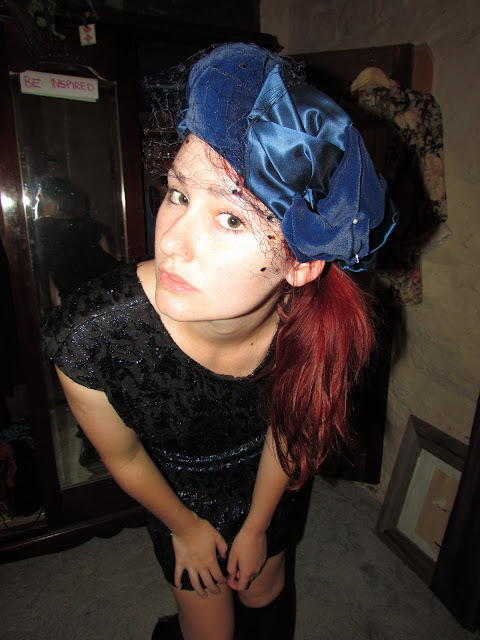 Also on my head is a piece I created myself using random scraps I found in my craft box. "Hype" my look if you like it!